Dry brushing is something I came across 100% by accident. I had had several severe colds – or perhaps all the same one, just elongated – and I was feeling CRAPPY. I was getting used to feeling bad, particularly in the gland region. Well, after several Google searches, including key words like “lymph nodes,” I got this Amazon link to a “dry brush for lymphatic drainage.” You know how you can get a lymphatic massage at a spa? Similar idea. Anyway, then I started researching the crap out of dry brushing. And then I started incorporating dry brushing into my everyday ritual, and I loved the results. It sped up my process of recovering from that awful cold…and it has a ton of other benefits, too. I even got Jennifer one for her birthday! 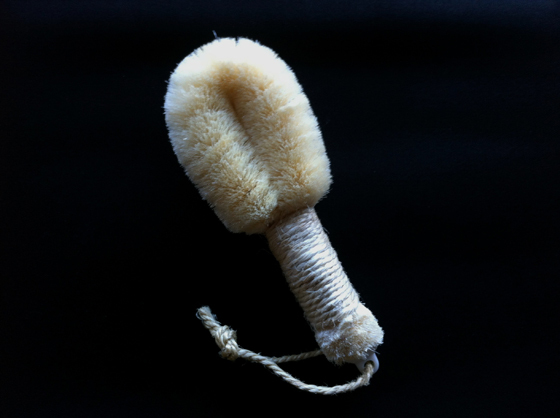 So, what are the main benefits of dry brushing? Increases circulation and skin function – invigorates! When purchasing a dry brush, you will want to buy one with 100% natural bristles. There are a lot of brands out there: I, personally like Earth Therapeutics Purest Palm Body Brush, made of 100% pure Japanese palm fiber. I recommend dry brushing right when you wake up, since the process is so invigorating. Use light to medium light pressure ALL over your body. Start at your feet, and make your way up. You should always be brushing toward your heart for maximum detoxification, so when you reach your upper back, chest, and neck – keep this in mind. It may feel a little prickly at first, so remember to not press too hard. If you’re anything like me, you will start to love the way this feels on your skin and the positive effects it has overall after a few days. You can even dry brush your face, but be very, very gentle. If you decide to do it on your face, use the brush in an upward, circular motion. Once you’re done dry brushing, step in the shower to rinse. Dry brushing isn’t going to keep you from ever getting sick, or eliminate all of your cellulite (what does?!). But I have found the positive effects to greatly help me in my everyday life, on top of giving me a tingly wake up in the morning, when I need all the help I can get. It’s a little contribution to my overall health and routine that has made a big difference! Have you tried dry brushing? What was your experience? I was just looking at the Earth Therapeutics brush on Vitacost the other day but it was out of stock! Just noticed it was back in stock and I’m looking forward to trying out dry brushing! I am so glad they’re back in stock! Dry brushes are such great gifts around the winter/holiday season, so maybe people were thinking just like we were and are grabbing them up! :0) You will love yours when you get it… I am definitely a convert! Thanks for reading Jessica!